What’s funny is that Reiner himself didn’t know the whole truth. 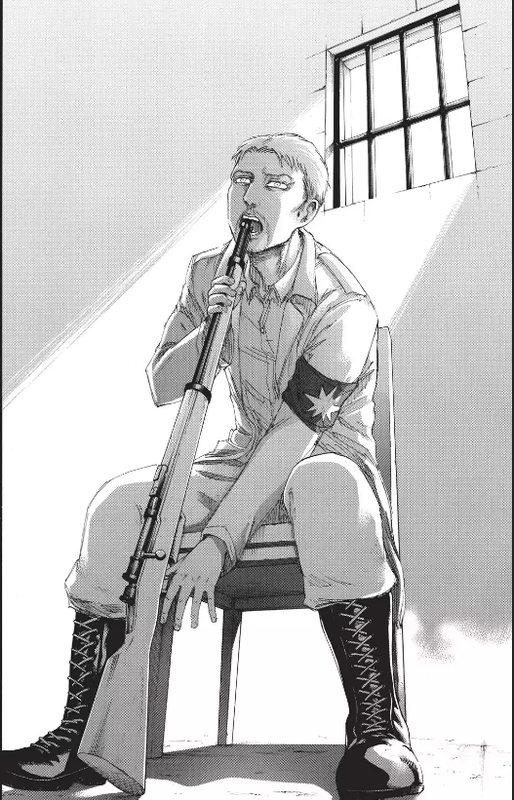 Indoctrinated while living in the Eldian camp (there’s some irony in Isayama directing his story this way btw) about the evils of those living in Paradis, Reiner of course discovers otherwise when joining the 104th Cadet Corps. As Eren later confirms to Reiner, the two are the same, discovering that people are people anywhere, good and bad and all shades in between. Add to that the weight Reiner feels for death among his comrades and the choice he made to continue his mission for personal reasons, and you feel downright sad for the bloke. Religion can be this way. It’s both simple and complex how people take the values they’ve grown up with and out of fear, pride, or some combination of the two, put it forward as undeniable truth without really being introspective, without really questioning the veracity of the Bible and the existence of God. They end up creating an object of worship that combines what they believe to be true with cherry-picked Bible verses, and the raise generations more of children growing up and doing the same, expressing loyalty to their parents’ values and faith even though, like Reiner, who grew up in an internment camp, they see the evidence that their loved ones are following blindly. This lack of sincerity in faith ultimately ends in failure. It leads its adherents to judge those around them when Christ directs us to look at our own hypocrisy. It creates a culture where racism is tolerated even though God opens his arms to all without prejudice. And it leads many of us individually to leave our faith in all but superficial ways when challenges come and we have only our own conceptions of faith to turn to, rather than to a genuine relationship with Christ. Reiner, as the most loyal of the young warriors in his generation, exhibits these failures. When taking Eren hostage, he completely loses it as his mind can no longer discern who the enemy is. He later becomes suicidal. And he certainly plays the part of the hypocrite, stating that he doesn’t care for his fellow cadets (though thankfully, Annie is always there to bring him to his senses). Not knowing the whole truth gets us in trouble in both big decisions, like those regarding our faith where we might easily become pharisees, and in smaller day-to-day choices, which often have to do with our relationships. How often do we look poorly on others in the decisions they make or the words they say without properly knowing their situation? And how can even ever really know what one is going through if we’re not them? I think maybe that’s part of the reason why Christ tells us to look at our hypocrisy rather than that of others. It would indeed take God to understand exactly what another person is going through—we are too limited, to imperfect to understand others 100%. And at least for me, I know my pride and my flaws lead me to judge, all the while as I don’t have an all-knowing comprehension. In other words, sometimes I don’t know the story behind why people act the way they do, but further, I never know the full story. And I hope that I continue to remember how short-sighted and hypocritical I am when it comes to others, because then I’ll perhaps reach out in love first rather than in pride. I don’t want to become a Reiner, someone so messed up because he is unable to embrace the truth—but even further, I want to be the person who loves on the Reiners, despite not knowing, and perhaps because I don’t know the whole story.